A Powerful Fruit And Vegetable Slicer. Prep Food With Speed And Precision. Lightning fast speed and incredible precision combine with commercial grade construction to create a powerful tool that's perfect for any kitchen. This seven piece slicing set will have you looking like a pro as you slice, dice, shred, grate and julienne any type of food. German engineering provides an advanced design that makes it easy to use, and the razor sharp cutting edge is micro-serrated to prevent sticking, and increase accuracy. It has a V-shaped blade that's forged from surgical grade steel, and it's set at the perfect angle to make any food easy to work with. Hard vegetables cut without effort, regular ones reduce to perfect looking pieces, and softer stuff like meats and cheeses are uniformly sliced without smearing, or getting stuck. It comes complete with four different inserts to adjust operation, and changing them out is fast and easy. With the addition of a collection tray to catch everything you cut, and safety holder to protect your fingers, this set has everything you need. Made from all metal instead of plastic, you know it will last for years to come, and with a rubberized handle and slip-proof feet, you know that each time you use it, the process will be safe, comfortable, and frustration-free. Dishwasher Safe. Stainless Steel Construction. Other slicers in this price range are made out of plastic. This one has all metal parts for the main frame, so it looks cool, but it's also incredibly sturdy and durable. The steel body also aids in cleaning because it resists staining, sticking and odor collection. V-Shaped Blade. Proven to ease the slicing process, the high quality blade is angled for ease of use. The straight edge cuts with incredible precision, and the micro-serration on the reverse side prevents sticking, and makes food glide easily. Non-Slip. Added rubber on the feet of the slicer and the bowl will prevent movement as you work. The tool will stay in place to increase safety and simplicity. Bowl Included. Most similar tools will have this key part as an option or not at all. This set comes complete with a collection bowl that reduces mess as it catches everything you cut. Use the slicer alone, or attach it to this bowl for added functionality. Because all of the parts will nest inside, and under the slicer, you can also use it for a compact storage solution. Super Versatile. There are few things this tool can't do. Slice, shred, chop , dice, grate, julienne and more. Most fruit or vegetable cutting tasks can be performed quickly and accurately with this set. Safety Holder Included. Your fingers will thank you because the blade will be less risky. The razor fine edge that makes this tool work so well, is pretty dangerous for your flesh. Hold food, and cut more of it without risk of injury thanks to this addition. The clear bowl included with this set adds convenience by reducing messes, and catching all of the food that you chop. Instead of letting fruits and veggies fall onto your counter, or into a round bowl that requires aiming, they are gathered neatly, just below the slicer. Because the tool actually affixes itself to this tray, you can slice with it sitting on a flat surface, or you can use the handle to hold the tool in a more vertical position, and the tray will remain attached. Cut with whichever orientation you prefer, and every last bit will remain contained. To attach to the collecting tray, first ensure that the handle is fully engaged. Secure the handle end first, and then the bottom end. The top side will clip on with the tab and corresponding notch, and then the feet will insert and rest in the recessed areas at the other end. To take off of the tray, lift the feet first, and then slide the slicer back to un-clip it at the top side. Lift up to completely remove. When attached, slice horizontally or vertically. The combo can be used on any flat surface, but you can also lift up on the handle to give yourself a more vertical angle. The non-slip feet on the bowl will prevent slipping. This tool comes complete with four different inserts to increase versatility. It has a two-sided insert to adjust the thickness for regular slicing, it has two julienne inserts, and it has a grating insert that also acts as a blade cover for storage. Other similar tools have complicated notches or slot systems that can be frustrating, but this one is different. Instead of getting annoyed when trying to change from french fry cutter to orange slicer, you will complete the transition in a matter of seconds. The large handle at the top is more than just for comfort because it also doubles as a locking mechanism to secure the blade inserts in place. To open and remove existing insert, pull the handle backwards to fold back. Once open, slide one insert out, and replace with another. Two slots on either side will guide the piece into position. Once all the way inserted, fold the handle back up until it locks in place. Your blade is now changed and secure. This part is perfect for grating cheese, but it also works well for harder foods like ginger, carrots and chocolate. When in position, it will cover the blade for safety, so it also doubles as a storage cover when you place the whole set in your cupboard. Simply apply firm pressure, and then slide foods across the surface for a thick, standard shred. To insert this part, and turn this tool into a grater, simply fold down the top handle. Slide up, and out, any insert you already have installed, and then slide this one in place. Fold the handle back up until it locks to secure the insert. This insert is plastic, so the food holder is optional. 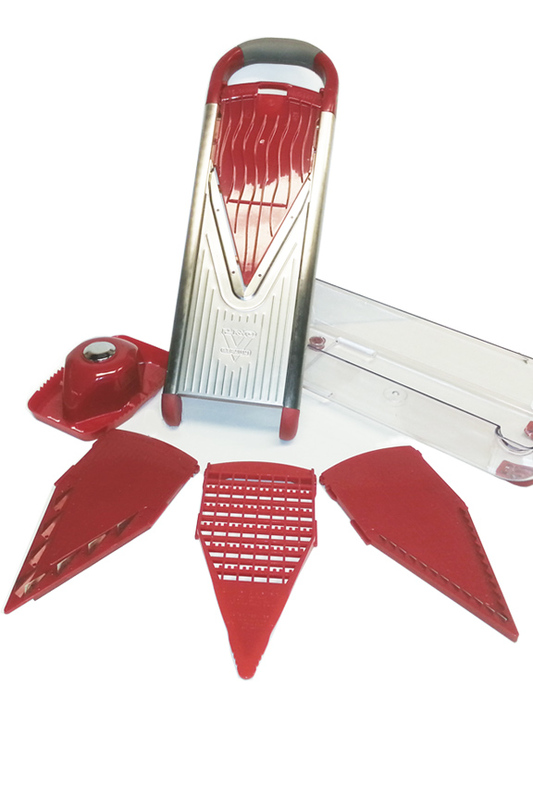 To grate hold food in hand or holder and then slide up and down while applying direct pressure. A 3.5mm and a 10mm blade insert are included for shredding, dicing and chopping things into sticks. These are the ones you would install when making french fries, vegetable pasta, carrot sticks, diced onions or anything else that's similar. Once installed, you will have a single thickness option that is equal to the width of the blade you choose. These inserts have several sharp points that stick up to cut vertically into your food with each pass. The food is then cut horizontally as you move beyond the v-shaped blade. Use a straight back and forth motion to chop sticks or shred, and use your choice of techniques to do the more difficult dice or cube. Fold back the handle to open the insert chamber. Slide out part already installed, and then insert your choice of julienne blades. Lift handle back up to lock in place. Always use the safety food holder to avoid injury. Attach food by pressing into the prongs. Reveal more as needed by pressing at the center. For shredding and cutting long pieces, simply slide back and forth. To make cubes, use a knife to cut horizontally when in the holder, and then slice like normal. To make cubes another way, slice straight down, rotate 90 degrees, slice again, rotate 90 degrees back, slice again in and repeat. This rocking motion will allow you to dice quickly. This piece allows you to adjust thickness when doing regular slicing. It can do thin cucumbers for salads, or thicker more standard slices so you can do tomatoes and onions for burgers, or fresh oranges for a snack. One side has one texture, and if you flip it over, the other side looks different. When the wavy side is up, you will cut thick pieces, and then the straight lines are facing up, the slice will be thinner. 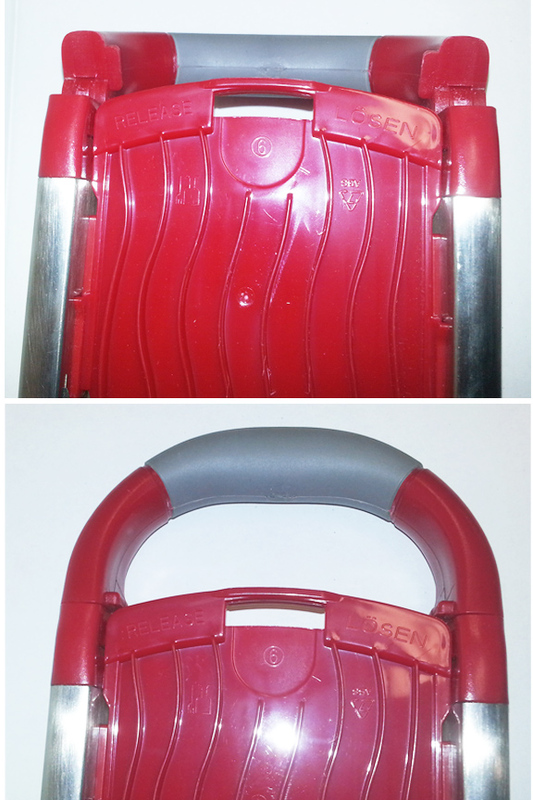 Insert by pulling back handle to open. Slide out any insert already there, and replace with this one. Flip handle back to secure in place. Select thickness by putting one side or the other on the top. Adjust thickness by taking it out, flipping it over, and reinserting it. Once in place, cut food by sliding back and forth past the blade. Always use the safety holder to protect fingers, and ensure you can slice every last bit of food. Keep your fingertips intact, and never waste food thanks to the holder that's included. It has metal prongs on the inside to poke fruits and vegetables, and hold them securely. A button on the top side will activate a plate on the interior to push down, and reveal more food as needed. It also allow you to slice right up to the last little bit, so nothing goes to waste. The large size leaves plenty of room for your fingers, and the wide handle provides a comfortable grip. Because it's designed for use with this tool, it's the perfect size and shape to make operation simple. Want even more versatility and functionality? We have more parts designed for use with this tool that will unlock advanced capabilities. If you have ever been annoyed by veggies that don't work with standard holders, then the Small Vegetable Holder may be just what you've been looking for. It work with smaller stuff like mushrooms, but you can also use it with awkward stuff by cutting it down to size, and tossing it in. For those that like their veggies to look fancy, a waffle blade is a must. Get the Waffle Insert to transform this tool into one that can make wavy slices or waffle pieces with holes. It's perfect for homemade french fries, but also nice for canning and salads too. When shredding veggies for salads and pasta, thinner is often better. If you would like a julienne blade that's even thinner that the one that comes standard, check out the 1.6mm Julienne Insert. It has two rows of blades to quickly slice skinny sticks with a uniform thickness. If all of those inserts sound useful to you, go for our Deluxe Slicer Set because it includes all three, and the parts featured here, for one low price. 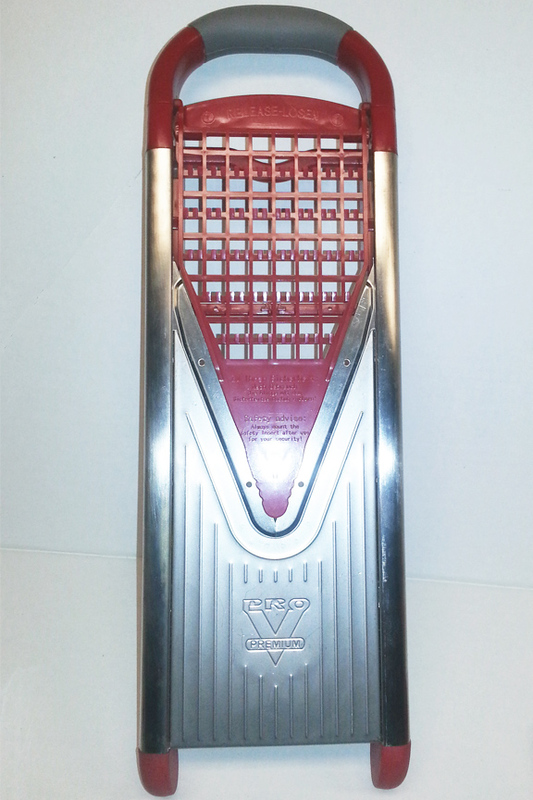 Our Stainless Steel V-Slicer is in a class of its own. Similar tools will cost twice as much when purchased elsewhere, but those usually come with fewer features despite the higher cost. If you pay the same price at another store, be prepared to use a plastic tool, and deal with less versatility. You may also end up with a dull blade, complicated mechanisms, or incomplete sets. With this tool, you are guaranteed quality, and you can be sure that it will be easy to use, no matter your skill level. A dangerously sharp blade will make anything easy to cut, and a variety of inserts will provide incredible versatility. Stop chopping everything by hand, but don't waste money on other mandolines that aren't any better. This tool is an incredible value when compared to the utility it provides, and the commercial grade materials ensure that it will last, even with regular use. Tested for ability and proven to perform well under any conditions, this tool would make an ideal addition to any kitchen. Uses slice, dice, chop, shred, julienne and more. Perfect for fruits and veggies, but also good for cheese and meat. A commercial quality tool at an affordable price. The advanced design makes it easy to use, and the razor sharp blade ensures perfection each time you use it. Order Yours Today. It was nice if it comes with original package. I've had three plastic V slicers over the last 25 years, and I bought this Pro for my daughter as a birthday present. Well-loved by all. I ran across this listing while looking for a waffle fry cutter and glad I did. They have waffle blades for it and we LOVE ours, use it all the time. Do not dry in dishwasher on bottom shelf. But do buy one you won't regret it. hi where is v-slicer made from? This one is German engineered, but manufactured in China. For Perfect Cuts Every Time. Slice, Dice, Chop, Shred & Julienne. Slice, Dice, Chop & Julienne. 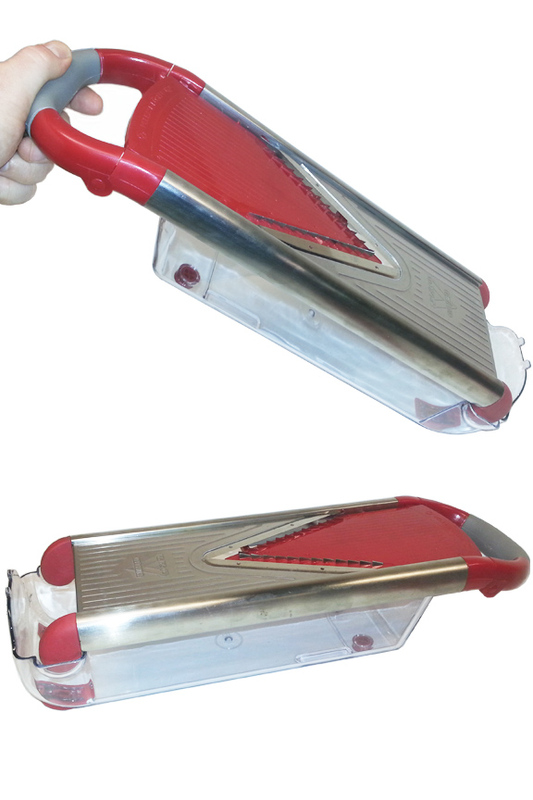 Fast, Easy & Safe Mandoline Slicer. Additional Julienne Blades For Your Borner V Slicer. Slice or Julienne Food Quickly and Easily. A wavy & waffle cut slicing tool with three thickness settings. For Safety When Using A Borner Slicer. A Money Saving Package. Get 3 Products For One Low Price. A Vegetable Shredder and Slicer. Perfect Results Every Time.